We went as back as 2014, to find this one from Rio. Bye bye Rio, you will be missed. He posted this one in 2015, from Salthouse Beach in the coast of Norfolk – a county in East Anglia in England. Next up is this blood-red London sky. Although slightly edited, the London skyline should not be underestimated for how dramatic it can be. It’s hard to tell where this is from, but it is as soothing as a sunset over the horizon can be. And what a way to wrap up the year, right? Travelling or not, the charismatic actor finds a bright moment in a dull day. This picture from Mumbai is proof! Just one of the many good-spirited picture and captions you’ll find on his Instagram feed. This is from New York‘s Central Park, indeed. Even the stormiest skies have a silver lining. You can take the man out of a dream, but not the dream (and the sheer love for dramatic skies, if that needs to be said) out of a man. This one looks straight out of a painting. Up in the air….. Again! Can never get enough of such skies, can you? So is the case with Abhishek Bachchan, it seems! From his most recent travels to Uttarakhand, in December 2018. 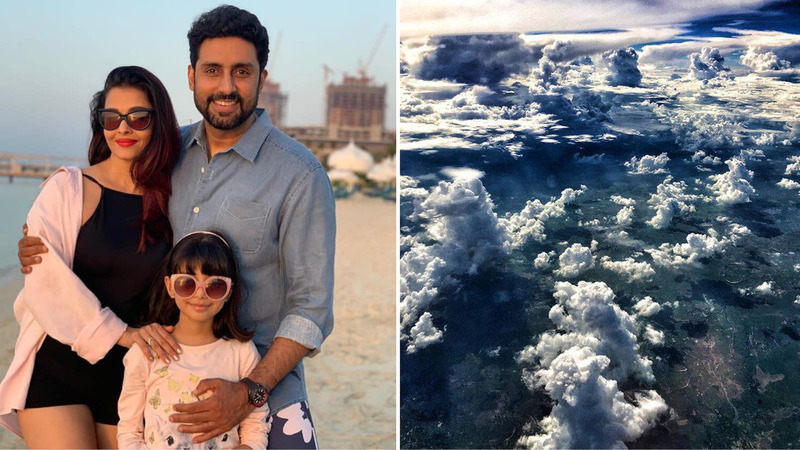 Maybe, this is a standard way for Abhishek Bachchan to begin a new year. And we’re definitely not complaining! Another, and the latest, forward-looking and inspirational post by the actor. Here’s wishing this dreamy young man, a very happy birthday, and a lifetime full of stunning skies! Related:Where Does Your Favourite Celebrity Like To Travel?